My one area of hesitation with Anchor has been its business model. The service is entirely free, and the company has never before shared its plans for any sort of monetization strategy. Today that changes, however, as Anchor is launching a Patreon-style listener support feature. Starting now, any Anchor podcaster can choose to activate listener support for their show, which enables listeners to sign up for automatic monthly payments of $0.99, $4.99, or $9.99 to support the show. The implementation here is important, and Anchor is making it very accessible: a podcast support link will be automatically added to the show notes for each episode, making the link available no matter which podcast app a user listens through. This link takes users to the support page on a podcast's Anchor profile, with payments processed by Stripe and available via Apple Pay on iOS and Mac, or Google Pay on Android. All support funds are subject to Stripe's standard fees, plus Anchor's own 4.5% cut, but the overwhelming majority of funds end up in podcasters' hands. I think listener support is an interesting development for Anchor in two main ways. 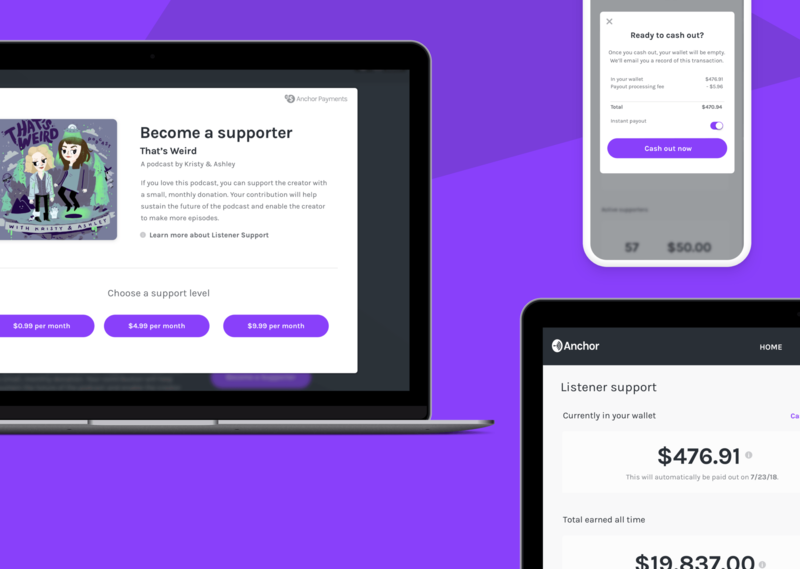 First, after working to democratize podcasting with its easy-to-use tools, it makes sense that Anchor now has its sights set on democratizing the payment of podcasters. Any podcaster with a decent following could use a third-party service like Patreon to get paid – and many do. And while Patreon isn't too much more complicated for listeners wanting to pledge support, it definitely brings more complexity to the side of podcasters. Using Anchor, a podcaster can flip a switch enabling any present and future listeners to offer support. Ultimately, complexity is diminished for both parties. The second thing making this news significant to me is that it's the first sign of a monetization strategy for Anchor. It's very possible the service will still introduce an ad platform in the future, but whether that happens or not, this is a thoughtful first move. It's respectful to both podcasters and listeners alike, and as such it feels like a good fit for the service and its goals. While I certainly don't want to see podcasting dominated by a single platform, the way video is owned by YouTube, I nonetheless continue to be impressed by Anchor. Whatever the company's future holds, it's a good thing making podcasting more accessible, and a good thing for podcasters to be rewarded for their work. Anchor users can activate listener support from their dashboard on anchor.fm.